Inert glove boxes are a type of controlled atmosphere glove boxes. They also called inert atmosphere glove box, nitrogen glove box, dry box, low oxygen and/or humidity glove box and anaerobic box. For an inert glove box to function, the internal atmosphere is removed and replaced with a purified inert gas. The most common inert gases are nitrogen and argon. 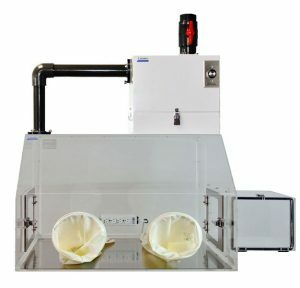 Basic inert glove box is based on the gas removal and refill operation. Oxygen and moisture levels are reduced to 1% through displacement and dilution. Unless they’re used with automatic purge control system, a continual flow of inert gas is required. The basic inert atmosphere glove box works under positive pressure, the regulated inert gas is introduced to the chamber through inlet and internal ambient atmosphere is purged out through outlet. Alternatively, a low negative pressure vacuum allows the main chamber of the inert glove box to be evacuated and then refilled with the inert gas. 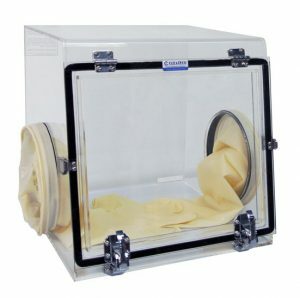 More sophisticated inert glove boxes use an advanced recirculating oxygen/ moisture elimination system along with the initial evacuation and refill operation to maintain extremely low (≤1 ppm) concentration levels. In inert atmosphere glove boxes, the use of dry nitrogen or argon will lower the oxygen concentration within equipment reducing any oxidation effects. These inert gases are most commonly used due to their high natural abundance and low relative cost. They are used generally to prevent unwanted chemical reactions such as oxidation and hydrolysis that is degrading a sample. Also, inert gases are naturally dry and do not hold moisture, by inflowing the gas into the chamber, humid air is purged out of the chamber. Inert glove boxes are typically kept at a higher pressure than the surrounding air, so that blocking the ambient room and even contamination get into the glove box. Note: Acrylic, Polycarbonate, PVC and most other plastics and even gloves are hygroscopic and permeable. The air pass through the membrane and they absorb moisture from outside the chamber and pass it inside. The inert glove boxes won’t maintain low level of RH and O2 if the inert gas flow stops. Here are the list of inert atmosphere glove boxes manufactured by Cleatech®. 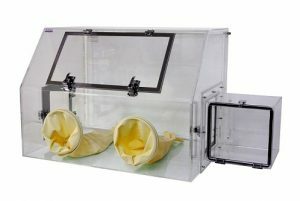 Basic Inert Atmosphere Glove Box, from 10 to 18 cu.ft. allows users to work with moisture and oxygen sensitive processes. Economic solution for analytical laboratory, clean room, electronic assembly and semiconductor industries. Designed to be lightweight and portable. Provide about 5 cu.ft. of inert atmosphere with optional antechamber. Available with optional accessories Argon or nitrogen purge control, O2 and RH monitor, stand, etc. 2 cu.ft. small glove box with optional inert gas accessories. features portability, cleanliness, safety, full containment, inert atmosphere. The tilt-up window provides convenient viewing and accessibility. 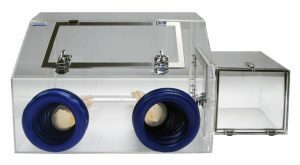 Closed loop filtered glove boxes that inside atmosphere filtered through a HEPA or ULPA filter by continuous re-circulation. Gas Inlet and outlet are used for inert gas purging and moisture and oxygen control. 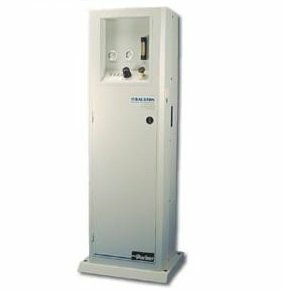 Available with optional accessories as oxygen analyzer, pressure gauge, inert gas controller, stand. etc. The cost of nitrogen produced by nitrogen generators is significantly less than the cost of bottled or liquefied nitrogen. They convert the compressed air to nitrogen (inert gas) with purity of 99.5%. They are ideal to work with Cleatech’s automatic purge control units that control the inert gas flow based on the oxygen and related humidity level set. Benchtop Fume Hoods, Get A Quote!